Have you ever felt terrified or scared while holding a razor? 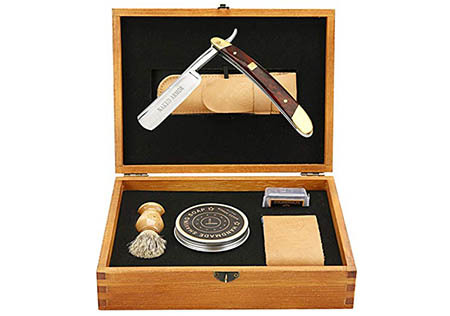 Are you interested to find what is the Best Straight Razor Kit for Beginners? Well, here comes the solution to all your problems because here you will get all the basic knowledge about the Straight Razor Kit for Beginners. Finding a good razor for yourself in the market can be difficult if you are a beginner. Also, the thought of having cuts and irritated skin can make you worried if you are using a straight razor for the very first time. Because, we have researched and found the top 7 solutions for a perfect shaving experience for all of you! Here, I have reviewed 7 top of the list straight razor kits which can help you make the right decision for yourselves! Although there are more advanced methods of shaving, still many of us prefer using a straight razor kit. If you have been into shaving for quite a long time you might have known your skin type and the best razor that suits you well. But, for the beginners who find it difficult trying a bunch of razors and spending a lot of money, here comes the solution. Now, all you need to do is check out the pros and cons of each and select your favorite one. Have a look on the list below. Why Should You Buy It? The A.P. Donovan Straight Razor set includes a high-quality steel razor and all the required accessories to become your first choice. Because it contains a high-quality blade material and a durable handle to find the perfect shave in seconds with no irritation. In fact, the mahogany wood handle gives a very nice grip with perfect equilibrium between the blade and the handle. Also, Its Japanese made blade with the hardness of 63 Rockwell is sharp enough to give you a real manly look. Apart from the A.P. Donovan straight razor, the kit also has a Badger shaving brush with very fine hair. The handle, on the other hand, is made from stainless steel and mahogany wood. If kept with care, it can easily last for years. The kit also has a shaving soap with a very mild fragrance. Moreover, you also get Kazakh cow leather strop for stropping. All these products come in a very nice, elegant-looking wooden box which is very easy to carry anywhere. The blade is made of Japanese carbon steel that provides a perfect shave. The heavy wooden handle of the razor increases its durability. American badger shaving brush provides a soft touch to the skin to find a good shave. The blade is not shave-ready. The steel of the blade is not stainless. Why Should You Buy It? If you want a safe shave, Naked Armor straight edge razor is just the right choice for you. The kit includes all the things you will need while shaving. Like, it contains the long lasting and stylish straight razor and gives you a money back guarantee. Plus, you can gift this set to your father, brother, husband or anyone else as the best quality gift! Moreover, talking about the razor, its handle is made up of antique wood grains with gold-copper double-sided handles. The blade itself is made of Japanese stainless steel. The best part is: its blade is 15.7cm long which means you can easily shave not only your mustache and beard but also your head. Moreover, because of its great balance, it gives you the perfect grip and does not keep falling off your hands while shaving. Although, it takes quite a lot of practice and patience to become a pro, still if you are searching for a cut-throat razor kit that would give you a true gentleman shave, Naked Armor straight edge razor is highly recommended. Also, the straight edge razor is that professional kit that you can also gift someone who loves shaving. No doubt, this could be one of the best gifts you can give to your loved one. In addition to this, the product comes in a very compact travel box with all the supplies. This means you can easily take it anywhere and shave wherever you want. Plus, when you purchase any straight razor you need to sharpen it first. But, this straight edge razor declares to be the sharpest blade which gives you a phenomenal shave that you’d ever wish for. Gives you the perfect grip. Ready to use (does not require any sharpening) . Made up of high-quality Japanese steel. Wood-handle shaving brush with soft bristles for easy application of the cream. The kit also contains a hand-made shaving soap. The blade might get rusted if left wet. Why Should You Buy It? Searching for a straight razor that is not too heavy on the pocket and works the same as a high quality, expensive one? Gold Dollar Straight Razor 208 is your solution! In fact, it is hand sharpened and therefore there is no match for this quality! Undoubtedly, the 3×6/8” razor blade is hand-sharpened, which makes it ready to use right out of the box. The blade is made up of high carbon steel. Unlike other straight razor blades, it has been hardened in a kiln. Hence, this makes it one of the best straight razor. Also, the kit includes a synthetic satin tip shaving brush, The Blades Grim soap and a 3” wide GB Buckingham and Sons strop for easy stropping and a box to keep your razor safe. So, with this professional and economical shave ready straight razor set, you don’t need to go to a barber for a shave every now and then. Rather, you can easily get a smooth and close shave at home. The bottom grooves give a great grip. Therefore, you can easily use it on an everyday basis. Shave ready straight razor would be really helpful if you have never used a straight razor before. It comes with care and instruction guide to help you use it the correct way. When compared to a Dovo Straight Razor, it may give you the same results, but you will have to pay ¼ of the price. Now, let’s talk about its handle: The elegant black and white checkered smooth plastic handle makes it look classy as well as fits perfectly into your palm. Tip: Strop your blade before every shave and maintain it with mineral oil after every shave. Ready to shave right out of the box. The instruction guide is also present in the kit. Made up of hardened high carbon steel material. The handle is made of plastic that is a bit less durable in a few cases. The blade might not be honed. Why Should You Buy It? If you like grooming and maintaining your beard, this kit might work for you. Containing everything natural and organic, this kit can be used without any worries. 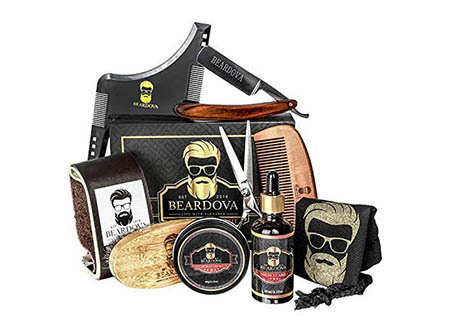 Most noteworthy, all these products are said to be of excellent quality, be it their wooden comb or their scissors which are perfect for trimming your beard as well as mustache hair. Moreover, the beard oil present in the kit is basically a blend of vitamin E oil, Argan oil, and Jojoba oil. All of these are 100% organic and free of any additives. Also, the beard butter provided in the kit works as a good moisturizer for your skin and also gives a glossy look to your beard. The beard brush is also 100% natural as it is made of boar bristles. Therefore, it makes your hair shiny and healthy without any chemical application. Furthermore, to keep all items in one place, a cotton bag is also provided in this beard shaping kit. Hence, this makes it quite easy to carry. All of these products come in a very nice magnetic box, ensuring you do not lose any of them and enjoying grooming your beard with all-natural, organic products. E-book which explains the use of every product in detail. The straight razor blade might be too dull to shave. All of these items are nicely packed in a hard cylindrical-shaped gift box. The razor present in the kit is made of premium quality stainless steel. The blades are extremely sharp, perfect for a very neat and clean shave. Not only this, the blade can easily be removed, so you can change it whenever you want. 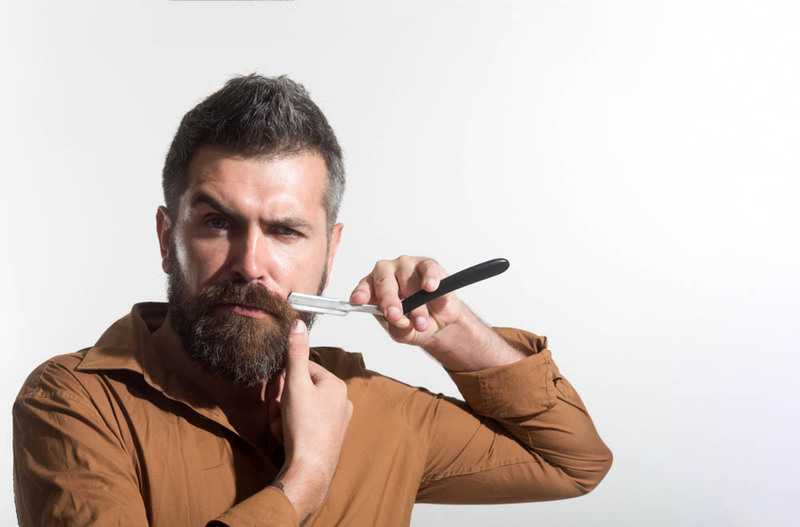 Moreover, the stainless steel scissors are ideal for trimming any kind of facial hair. Not only you can use it for trimming your mustache and beard hair, but it also works well when it comes to nose-hair trimming. Finally, the metal comb has a very compact size that easily fits in your pocket. It comes with a built-in bottle opener, which is an extra plus point. Plus, the wide metal comb helps overcome any kind of irritations and itching. All you need to do is, just apply a bit of Hunter Jack beard oil before combing for easy detangling. The kit comes with 10 straight razor blades as a bonus. Easy grip scissors give perfect trim. The locking system keeps the blade in place. Ideal for gifting as a Birthday or Anniversary gift. Good to use on a daily basis for professionals and even beginners. The blades don’t stay tight in the holder. The metal comb might pull off your hair due to its sharpness. Why Should You Buy It? 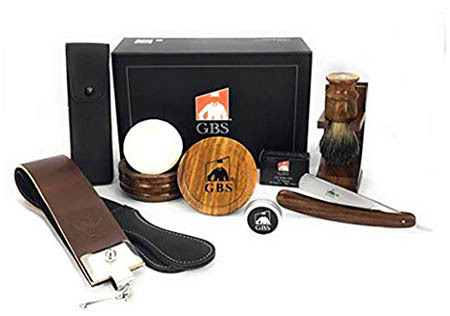 The USA- made GBS Shaving Kit can be the right choice if you are planning to get started with shaving. Wood straight razor, a leather strop, wooden shaving bowl, shaving brush and what not. It has everything you have ever thought of, having in your dream shaving kit! The 5/8” wooden handled GBS straight razor gives you just the right shave. You might take time getting used to it, but once you know the proper handling, you can easily get a smooth and close shave. Plus, the 21mm knot synthetic shaving brush gives you the perfect distribution of the cream and creates a very rich lather. Moreover, the kit also comes with a very decent-sized wooden bowl and a lid to keep your soap safe and clean. Alternately, you can also use the bowl to keep your favorite GBS Conditioning cream. On the other hand, the soap in the kit has all natural ingredients and no additives. Hence, it smoothes out your skin and also reduces razor bumps and burns. Also, it is suitable for all skin types. The kit not only includes a 20” long leather strop with a clip for easy hanging but also has all the honing accessories. Now, you Don’t need any professional to strop and hone your blade, but you can do this on your own. BONUS: With the kit, you get an antiseptic natural deodorant, an aftershave healer and a skin toner as well. Very fine edge blade that cuts very well. The soap contains no harsh chemicals or preservatives. Double leather strop to give your razor sharp and smooth finish. Razor and brush stand to keep things dry. The strop strap is too small. The wooden-handled straight razor gives you a very smooth and close shave. The smooth skin without any bumps or rashes makes you fall in love with this kit. Before using the blade, you can either apply shaving cream or gel or oil. All three of them are meant for the same purpose. It’s totally your choice to choose what you like the most. After you are done, apply the shave tonic (also available in the kit) to make your skin even better. End up with the after-shave lotion. All the products are made up of high-quality ingredients with really good smell. 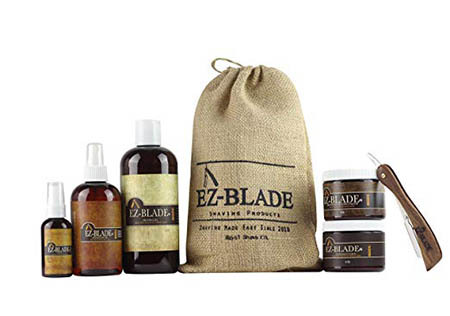 The EZ blade shaving gel gives you a waterless smooth shave. A step-by-step guide booklet is also provided in the kit. The razor has double edge blades. The blade does not seem sharp enough. When you will search for a straight razor, you might get confused and a little puzzled what to buy and what not to. Also, you might buy a razor and then don’t like it. In fact, buying different kinds of straight razors and then selecting your desired one can be a little pricey for you. So, for your ease, I have laid down a simple plan that you should keep in mind whenever you plan to buy a straight razor! For instance, keep in mind how often do you shave? If you have a habit of shaving every day, then you don’t want to have a razor that has a dull blade or one that requires stropping every now and then. However, if you shave rarely, you won’t mind stropping it each time before use. On the other side, if you are a professional barber you might want a razor that has an easy grip and one that perfectly fits in your palm. When you know how and how much are you going to use the razor, the next question to think about would be that what exactly do you want in a straight razor kit or what features make a kit worth buying. A straight razor is probably the oldest shaving tool. However, the specifications of the razor could have a great impact on your shaving quality. To make sure that you chose the absolute best quality straight razor, according to your needs, let’s have a look at the factors that a make up a good razor. A good quality blade makes a good razor. However, it is quite difficult to find which type of steel is used. Good-quality blades do not require too much stropping and last longer. On the other side, low-quality material needs to be sharpened more often and easily gets blunt. Therefore, we suggest buying a razor from a renowned brand to avoid any mishaps. Carbon steel blades are also considered a good option. The width of the blade is actually the measurement from its head to the upper spine. Generally, the 5/8 size blade is quite manageable for beginners. When you use a straight razor and you sharpen its edge, you are actually taking away the metal from the edge and also from the spine. The more you sharpen it, the more it gets smaller and smaller. So, if you start with a wider blade, you have a lot of life to that blade. A 5/8 size blade is a reasonable size to start with and can easily last 100 years. Round tip blades are considered the best for beginners. Because of its round tip, you can easily shave behind your ears without cutting yourself. Some other tips that are also prominent include square points, French point, spike point, Spanish point, and Barber’s notch. With a little practice, you can become a pro using any of them, but if you are a beginner go for a round tip blade and then try other points. This is another important factor that you cannot ignore. You can find razors with different handle materials. Plastic and wood-handled razors are the most common. However,you can also find straight razors with handles made of either brass or steel. Wood straight razors look more classy than the plastic ones. You can even find some razors withy ivory handles, but those are very rare. Straight razors come in different shapes and colors. Also, there are some which have carving of the logos or even the brand name. If you are planning to use your razor for longer, you might want to buy one that is eye-catching and one that not only works well but also looks elegant beside your wash basin. Last, but not the least comes the price. 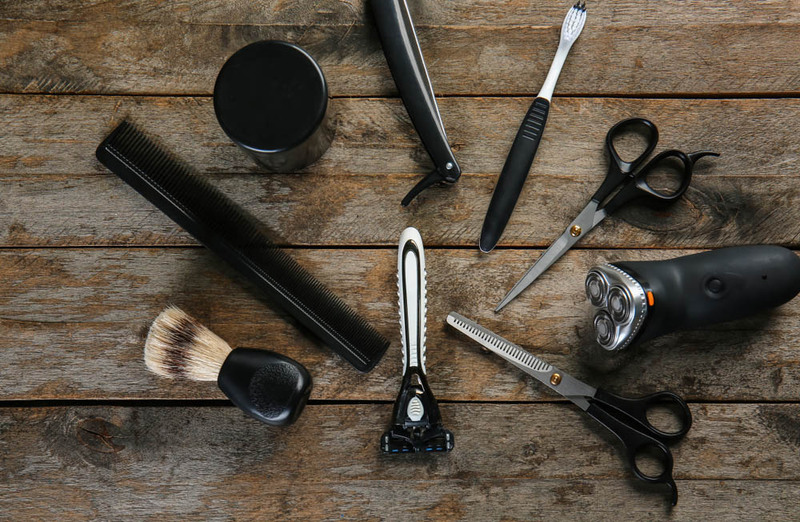 Of course, you have definitely made your budget before searching for a good straight razor kit. Buying very cheap razor cannot give you the desired result. However, if you are a beginner, investing a huge amount also does not sound practical at all. Now when you have got your favorite razor, all you need to do is grab all the other accessories and quickly start shaving. To apply your shaving cream or soap and lather it, you will need a good quality shaving brush. Some kits include good-quality shaving brushes. If not, you can easily get one but make sure to check the quality of the bristles. When you are shaving with a straight razor you are definitely going to need a good-quality shaving cream or soap. You can also use shaving gel for this purpose. Some kits also provide shave oils to apply before shaving. Straight razor blades need to be stropped. Because stropping keeps your blade sharp and gives a very close shave. When it comes to blade sharpening, stropping is not enough. You can easily find honing blocks or even honing pastes to get the perfect sharpness. The sharper the blade, the easier it is to get an easy shave. Lastly, you need a good after-shave lotion or balm depending on your skin type. This actually heals up your skin after shaving. How to Hold a Straight Razor? Use the hand that you mostly use in shaving; it can either be your dominant hand or non-dominant one. Hold the blade with your first 3 fingers from the back. Make sure your ring finger lies exactly at the point where the blade and the handle meet. Then, position your little finger on the tang of the blade. Lastly, place your thumb on the side of the blade, opposite to your 3 fingers. Once you know the proper handling, you won’t find a straight razor difficult to use. Check the sharpness of your blade. If not sharped well, strop it with your leather strop. Moisten your skin with a towel dipped in hot water to open up your pores. For best results, shave right after taking shower. Apply a coat of shaving cream on your skin. Hold the blade correctly and at a 30-degree angle. Shave in the direction of your hair growth to get a smooth manly look. Not prepping your skin: This is the most common mistake that leads to rashes and bumps. Actualy, people often skip this important step. For this, you just need a good cleaner to clean up your skin. Damp your skin with hot water to open up pores for an easy shave. Not lathering your skin: Applying a shaving cream or soap makes it easier for the blade to slide. Without any lather your skin may become rough and coarse and the chance of getting cuts also increases. Holding the razor at a wrong angle: The correct holding of the razor also plays a great role in smooth shaving. If you hold it too far you won’t be able to cut properly. Holding it too close can also cut your skin along with the hair. Make sure to hold the razor at a 30-degree angle. Shaving against the grain: This can make your skin rough and dry. Therefore, the best way is to shave with the grain to avoid any irritation and burns. How to strop a straight razor? Hang your strop on the bathroom drawer with the hook provided. Hold the strop tightly with one hand. Take the razor in your other and hold it with its shank and place it flat on the canvas strap. Sweep the blade to and fro for about 15-20 times in each direction. Repeat the same process on the leather side as well. How long will a straight razor stay sharp? It all depends on the quality of the blade and the stropping technique. However, a shave ready razor can easily shave for quite a long time if stropped regularly. Wet your honing stone with water. Then, place the razor on the stone and gently move it on the stone to and fro. This might take some time but be careful not to apply too much pressure or else you will end up ruining your blade. How to maintain your straight razor? Straight razor care is quite easy. Wash and dry your razor each time after use. Moreover, it is suggested to grease your razor with oil when not in use for longer periods. A Product should always give you the quality that you paid for and give you long durability. Apart from the wastage of money, it is just not convenient to run to stores every time you want to shave. 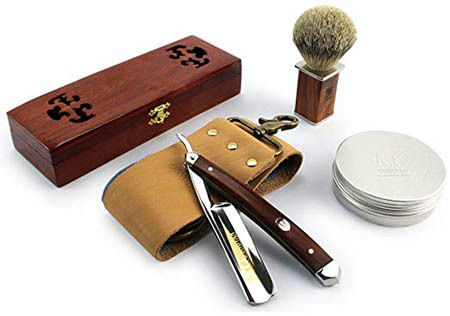 Buying a straight razor kit is a difficult task for most of the beginners and it may take them time to choose one which is perfectly suitable for them. However, you can now make the decision of choosing the best straight razor kit for beginners quite easily. No matter which straight kit you buy, just make sure to check that it’s long-lasting, pocket-friendly and has a good quality sharp razor blade. Don’t get distracted just by the good packaging. Remember to take proper care of your razor; wash and dry it each time after use, keep on a dry surface and apply a few drops of any synthetic oil (if not in use for long) to ensure smooth and better performance. 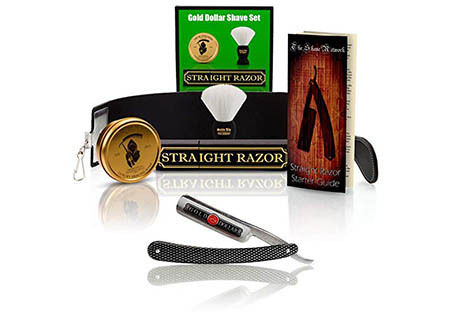 Most of the above-mentioned straight razors are great including Naked Armor straight edge razor, EZ blade shaving kit and Gold Dollar Straight Razor 208. 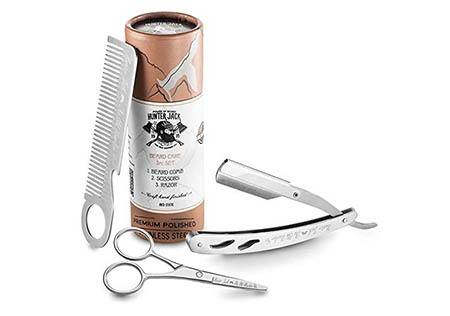 However, I would say that you might consider the BEARDOVA Straight Razor Kit above any other straight razor kit. It has everything that you want in a good-quality razor. Also, you get all the other accessories as well including scissors, leather strop, shaping tool and comb. One thing that makes it our favorite is that all the products are organic and can give absolutely no harm to your skin. So, you would not regret over this pick ever, I bet!